Sentinel MVETM software is a new generation of video management Software (VMS) for adaptive bitrate streaming. It enables real-time video communication and management for wireless and mobile edge devices, from one or many devices, to one or many user clients. 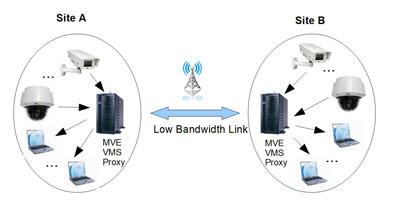 Unlike others live streaming relies on secondary low resolution stream with VPN to maintain connection, MVE dynamic bandwidth management encrypts the best resolution video and pushes to cloud server for broadcast without additional VPN overhead. In addition, we have proprietary RTP flow control algorithm for satellite/cellular transmission to minimize latency and monitor bandwidth constantly. 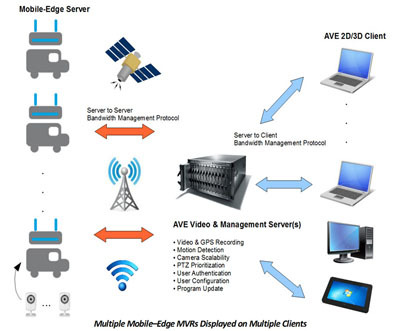 The Video Management Server component of MVE System is designed to scale the number of cameras support by MVE 2D/3D client. It sits between cameras and MVE clients to manage the bandwidth from video server to clients dynamically (adaptive bandwidth management). The server will stream the appropriate resolution and frame rate based on what cameras are visible by individual end user 2D/3D client and available bandwidth. 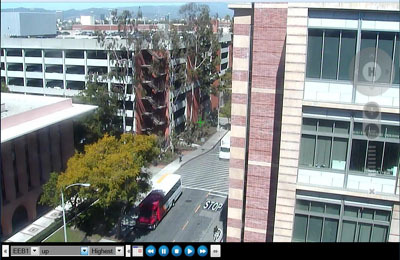 Video server will encode video using the best available codec in real time for client. Our adaptive bandwidth management protocol is suitable for any transmission medium with high bandwidth fluctuation. The available bandwidth is constantly monitor. There is no need to pre-set medium profile or modify streaming resolution/frame rate day-to-day when adding new cameras or users. Another way to conserve bandwidth is the use of MVE Video Management Server as proxy between two sites that share a low bandwidth link. At any time only one copy of camera video with highest bit rate request will send between sites no matter how many users request the same camera video. The two sites will also manage the bandwidth for all camera video requests and reduce the bit rate fairly among all cameras dynamically, in order to maximize the use of low bandwidth link. 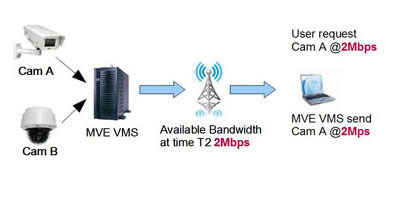 All the above techniques allow MVE Video Server to achieve its objective of using minimum bandwidth possible to deliver videos to large number of clients. This is ideal for enable monitoring and servicing of remote infrastructure. 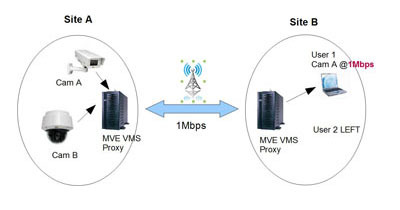 MVE Proxy Server enables scale to unlimited number of web users by deployment more web servers. It provides better security as hacking of web server machine will not affect main MVE VMS to do recording and serving MVE 2D/3D clients. Besides, private video from the main MVE VMS will not able to access by the compromise web server machine. Up to 7 MVE VMS Proxy can chain together to provide service to increasingly larger area (e.g. building, site, city, country, continent). This ensures video bandwidth are utilized efficiently all the time. 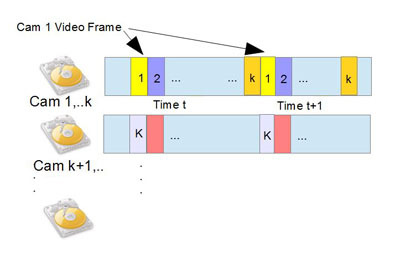 MVE guarantees latency for VMS is no more than three seconds (typically less than one second) when frame queue to send out or it will drop the frame. MVE optimizes the use of hard drive by recording video sequentially, thus minimize drive head movement, maximize transfer rate and drive longevity. As video frames arrive in real time, MVE mingles frames from different cameras in proprietary file format. Similarly, multiple camera videos can playback by reading from MVE recording storage sequentially to minimize seek time. 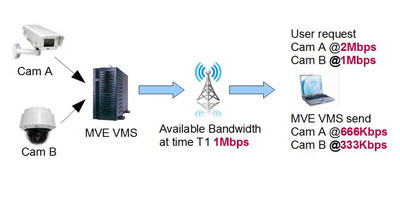 To distribute the workload, MVE supports parallel recording on multiple hard drives. 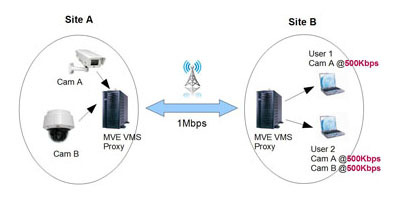 MVE creates a persistent and secure connection to push video from mobile video server to a fixed-IP video server. It supports on demand push with request from fixed-IP video server by maintaining live connection without constantly streaming video to save cost. 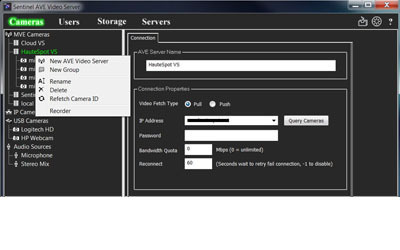 MVE simplifies configuration for cloud/central server when plug-in in new mobile video server, mobile cameras will show on user end automatically with zero configuration. 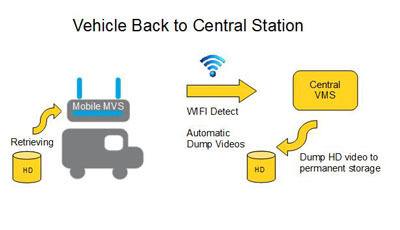 MVE automates video dumping to central video server when mobile server back to central station. After dumping to permanent storage, clients can access original video resolution without using precious cellular link bandwidth. 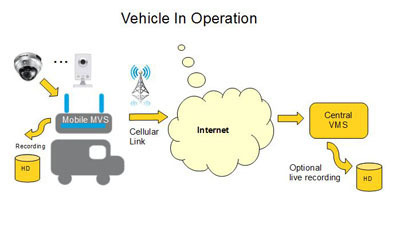 When mobile video server is on road, MVE still allows video download and replay from mobile video server at the expense of competing bandwidth with live streaming. Easy to use interface to define cameras, users group, user's priority, recording schedule, recording storage, dumping destination, encoding properties, recording bit rate, GPS location etc. Server configurations are encrypted to prevent unauthorized access to reveal camera password. MVE is ONVIF compatible for integration with existing VMS. 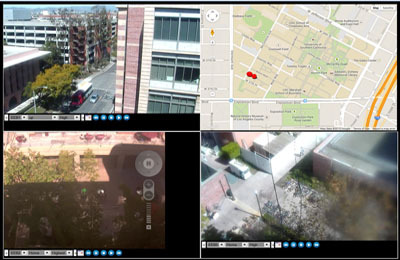 It supports any mobile ONVIF camera Apps from iOS/Android/windows to view and control camera. 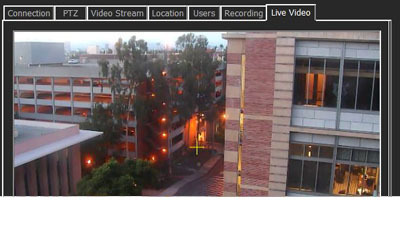 MVE also supports RTSP streaming over HTTP/TCP/UDP to view by any RTSP compatible client behind firewall. Custom MVE library is available as request to integrate with your existing application using MVE adaptive bandwidth management protocol. For camera supports, MVE works with ONVIF compatible camera, USB camera, IP camera from Axis/IV&C/Sony/Vivotek etc. and any RTSP/RTMP/HTTP camera streams. Security is of utmost important concern for our customers. All connections to/from video server are verified and encrypted. We use AES 256 bits salted key with MD5 to transmit video (live streaming/playback/download/dumping). Video and GPS data is stored with 4096 bits RSA signed for tamper prevention. Copyright © 2019 Sentinel AVE, LLC. All Rights Reserved.